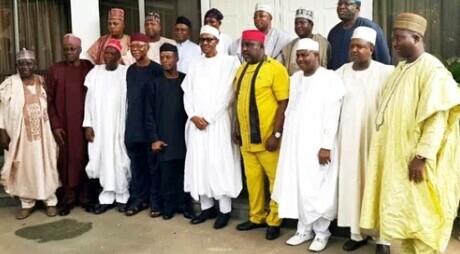 The Chairman of the Nigerian Governors Forum, Abdulaziz Yari, has spoken out on the ongoing negotiation for a new national minimum wage after a meeting of the governors of the 36 states of the federation on Wednesday night in Abuja. According to Tribune, the Governor of Zamfara state, told reporters that the governors want the national income to be examined over the last 14 years so that its exact position can be determined. Speaking against the backdrop of the freezing of Akwa Ibom and Benue states government accounts by the Economic and Financial Crimes Commission (EFCC), Yari said that even President Muhammadu Buhari will not support the illegalities perpetrated by the agencies. He said: “We believe strongly that the government of President Muhammadu Buhari will not sit down and supervise this illegality in the system.